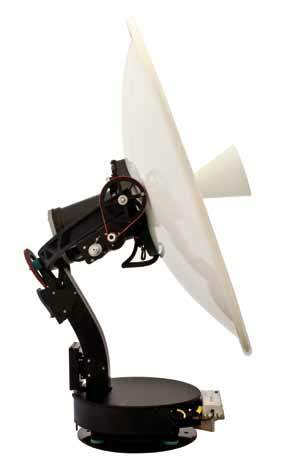 Jotron SatCom of Norway is launching a new, 3 axis, light weight, 1.25m Ku-band VSAT antenna. The antenna weighs only 110kg which is similar to other 1 meter antennas. The BUC and other RF equipment are mounted directly at the feed on the back of the dish eliminating the need for waveguides and additional counter balance weight. This saves both weight and size allowing the antenna to be mounted in a 62" radome of similar size to 1 meter antennas. The cross level arm is specially strengthened to eliminate the need for shock and vibration dampners. It has an elevation range of -23 degrees to -120 degrees. The Jotron B120 is Open AMIP compliant for interface to iDirect and other modems for beam switching. The antenna has a built in wifi router allowing it to be monitored and controlled with remote acccess software from a distance of 10 meters. There is also a camera and LED lights within the radome fascilitating remote maintenance. The software has a built in spectrum analyser,and the ability to log antenna performance every four seconds, maintaining historical records for up to two weeks. 18868 visits to this page since 28 Nov 2012.